You’ve probably seen the new KFC commercial. An actor playing Colonel Sanders dances like Patrick Swayze dancing like Johnny Castle in Dirty Dancing, and a freakishly oversized Mrs. Butterworth’s bottle is dancing like Jennifer Grey dancing like Baby. I saw this commercial on Sunday about 5,000 times in between live coverage of grown men destroying one another’s bodies playing football, and I never once questioned it. The question I asked myself was never, “Why is the Colonel involved in a sexually charged dance routine with a female-shaped maple syrup bottle to the song ‘(I’ve Had) The Time of My Life’?” Nope, my only thought was, “When is Thrillist going to ask me to eat KFC’s new, limited-edition chicken and waffles dish with Mrs. Butterworth’s syrup?” The answer was 12 hours later. Here's how the dance played out. With the rise of pizza and Mexican fast-casual restaurants allowing you to customize whatever you want on your pie or in your burrito, KFC follows suit and doesn’t specify any particular way to chicken and waffle. Do you want a one-waffle basket with three-piece tenders, two-piece drum & thigh, or a one-piece breast? 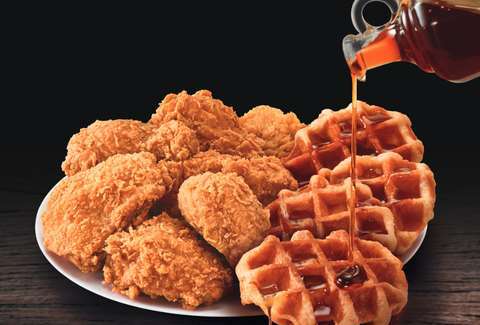 How about a two- waffle Big Basket with four-piece tenders, three-piece drum & thigh, or a two-piece breast & wing? Add a side of mashed potatoes for a buck? 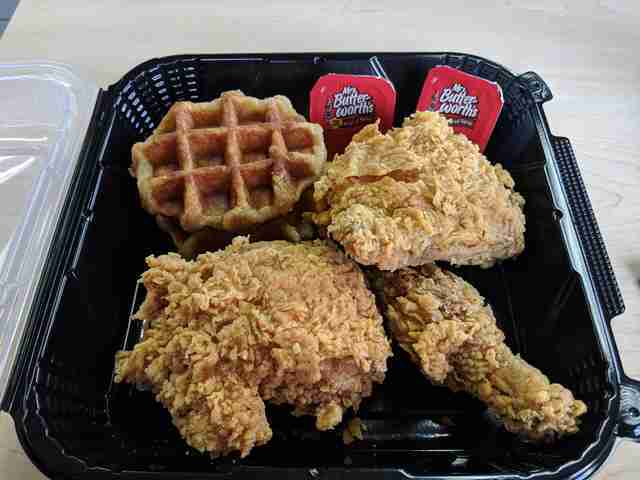 It took a minute or two for me to order because of the millions of options to choose from, but I settled on a two-waffle Big Basket with a three-piece because there are other fast food spots I’d rather have chicken tenders from, and KFC has been doing this fried chicken thing for a while. $7.49 and 5 minutes later, I sat down with a heavy tray of fried chicken, waffles, two mini plastic boxes of Mrs. Butterworth’s, and multiple packets of Buttery Spread. Since most Americans live within 5 minutes of a KFC and need food to survive, chances are you’ve eaten an extra-crispy drumstick. I’m not going to bore you with how it tastes. The fried chicken I had here came out hot, crispy, and greasy, and it’ll always be available at KFC. Instead, let’s talk about those limited-time waffles, and how the chicken pairs with ‘em. I’ll admit I didn’t have high hopes for the waffle. It was served at a pleasantly warm temperature and looked thick and fluffy, but what the heck does KFC know about waffles? I imagined it would be dry and need more Mrs. Butterworth’s on it than could be squeezed out of that human-sized one in the commercial. And how are you gonna make the iconic bottle a part of the ad campaign and then serve boxes of the syrup? What a bummer. But I forgot all that when I took a bite of the waffle. It tasted freshly made and like it had plenty of butter and maple syrup baked in. It wasn’t dry in the least -- this was actually good! Why wasn’t Colonel Sanders dancing with a huge waffle in the commercial?! But it was my duty to try the waffle as the Colonel intended, so I squeezed Buttery Spread out of the ketchup packet-style container and poured on the Mrs. Butterworth’s. And I immediately wished I hadn’t. I know the corporate synergy was trying to get me stoked on having Mama B available inside a KFC, but it was like pouring a cup of peanut butter and sugar on a Reese’s. First of all, all that stuff is already in there. And why try to improve greatness? The true test of chicken and waffles is how they taste together. So I took a bite of the drumstick and cut a piece of the waffle (without the Mrs. B or the Buttery Spread) and ate ‘em together. And it tasted like a decent fast-food approximation of what makes chicken and waffles so damn craveable: it’s salty, fatty, sweet, and savory all on one plate. Just don’t imitate the Colonel and dirty dance with one of those Mrs. Butterworth’s packets in the KFC dining room. You’ll creep people out.